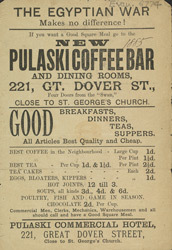 In the 19th century small, independent coffee shops and restaurants were largely run by the Bohemian English middle-class and immigrant entrepreneurs, such as the Pulaskis. Exclusive gentlemen’s clubs catered for the more wealthy members of society, so these coffee bars became popular with working men, and by the end of the century with working women. This advert opens with the sentence: "The Egyptian War makes no difference!" This is a reference to the economic and culinary downturn that accompanied Britain's involvement in combatting the Mahdist Jihad that raged through Egypt and Sudan in the 1880s. Britain had become particularly involved in the affairs of that region when the Suez Canal was opened in 1869. Indeed, in 1873 Britain and France undertook shared responsibility for Egypt's national debt in order to control Egyptian fiscal policy, and thereby any trade stemming from the canal. When Mahommed Ahmed's Jihadist forces overtook Sudan, it sparked widespread anti-European riots in neighbouring Egypt, and Britain in particular took a bellicose line in putting down any insurrection.